Andy Barton has appeared regularly on television, on radio and in the press in the UK and Worldwide. He is a regular contributor for various leading media sources including BBC News and Newsnight, ITN, Sky News, Five News, The Times, The Daily Telegraph, Daily Mirror, CNN, FourFourTwo, Mens Health, TalkSport. BBC World Service and Radio 4. Andy has also appeared in documentaries and more light hearted entertainment programmes on TV and radio. He has written about mental performance for a number of publications including the Times, the Guardian, Daily Mirror, Daily Express, Yahoo Eurosport, Inside United (the official Manchester United magazine), Castrol Performance Index, British Eventing Life and has been a reqular feature writer for Fighting Fit and Cycling Plus magazines. Andy has also presented videos on sports performance, including a collaboration with Soccer Mindset Academy with whom he has created an online course for young players. The aim is to reach 1 million players worldwide in the next 5 years. He has presented two DVD's on mental performance for rugby coaching specialists RugbyCoachingVideos.com and has also featured in three books, the Kraken Opus Formula One Edition, My Cultured Left Foot by Musa Okwonga. (nominated for the William Hill Sports Book of the Year) and The Best of Soccer Journal: The Art of Coaching by Jay Martin. The Guardian - "How the psychology of the England football team could change your life"
England players seem happier and more grounded - and much of the credit goes to psychologist Pippa Grange. What can the team's approach teach us all about facing fear and failure? The Times - "Eddie Jones must keep players focused on the World Cup"
Andy's article for the Times about the next steps for the England cricket after losing 3 matches in a row in the Six Nations. How can players cope with the pressure of the Big Dance? Gridiron spoke to three psychologists about handling the mental side. BBC2 The Premier League Show - "Escapology"
Interview discussing the psychological effects of the relegation battle on the teams at the bottom of the Premier League. 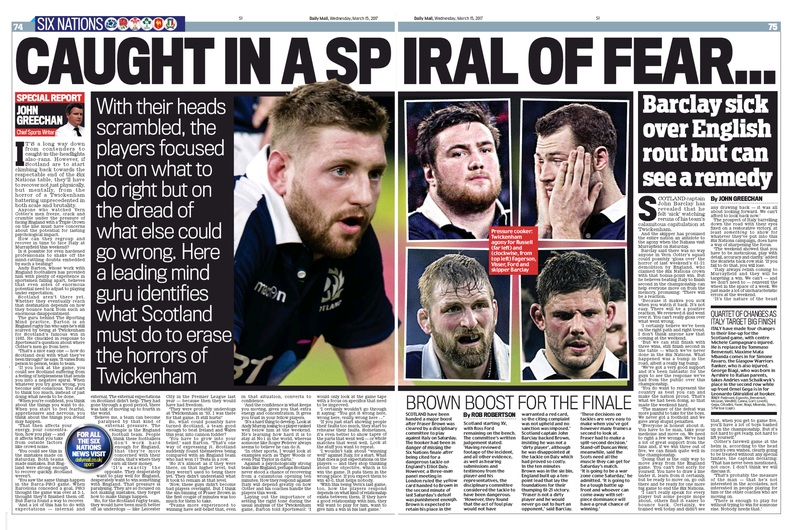 The Daily Mail - "Caught in a spiral of fear"
With their heads scrambled, the players focused not on what to do right but on the dread of what else could go wrong. Here a leading mind guru identifies what Scotland must do to erase the horrors of Twickenham. TRT World - "Insight with Martin Stanford"
Fitness trackers, do they actually help support a healthy lifestyle and help you lose weight? The Sunday Post "Joey Barton could make a comeback like Cantona, say two leading sports psychologists"
FC Business Magazine "The Soccer Mindset Academy"
Designed with the ethos of helping young players to master their thinking, Soccer Mindset Academy is a comprehensive 11-module video course, and it has been developed by one of the very best around, in Andy Barton. A leading light in mental performance coaching, Barton’s clientele over the past 15 years has included elite-level ﬁgures from the sporting arena, with TV, radio and print media often calling upon him for discussion on performance issues. Daily Telegraph "London Marathon training: how to make the most of your last 48 hours before race day"
Quelques mois après avoir remporté le titre de champion d'Angleterre, Chelsea n'a plus le sourire. Les Blues ont manqué leur début de saison et n'ont que quelques points d'avance sur le premier relégable de Premier League. Le Monde "Mourinho en surchauffe"
Le « supporteurisme » a beau être une tradition en voie de disparition dans les tribunes anglaises, elles n’en gardent pas moins un sens inégalé de la vanne bien sentie. Carp UK Magazine "Think yourself a better angler"
Men's Fitness "The big picture"
The influence of physical attributes over sporting performance is obvious, but can your personality play just as great a part?" Training for a marathon - or any race - isn't just about the physical preparation. The mental aspect is arguably just as important, as Andy Barton explains. Huffington Post "Wimbledon 2015: Andy Murray Uses Psychiatrist To Up His Game, But Can Therapy Really Make A Difference?" Andy Murray may be a favourite to take home the title of Wimbledon Champion 2015, but he's found a way to keep a cool head. Daily Express "The hidden benefits of exercise: How working out fights wrinkles and boosts the brain"
The Guardian "How to run a marathon in your mind: 12 tips for winning the mental fight"
Sky Living "Who'd be a billionaire?" Prima Magazine "Stay strong! Stick to healthy living 7-days a week"
Psychologies Magazine "How to create positive associations with fitness"
Hello! Magazine "Top tips for doing less to achieve more in fitness"
Goal.com "Suarez needs help, claims sports psychologist"
Daily Telegraph "World Cup 2014: The task facing England's sports psychiatrist Steve Peters as Uruguay await"
Yahoo Eurosport "Preparing players for World Cup success"
Daily Express "Croatia have nothing to lose while the weight of a nation lies on Luiz Felipe Scolari"
The new craze of 'experience' events is replacing treadmills and plodding around in the park. Daily Express "Paint splatters, Zombies and neon: How to put more fun in your run"
Daily Telegraph "Psychiatrist Steve Peters must set his sights on lifting Liverpool's England World Cup contingent"
Cycling Plus Magazine "11 ways to spring clean your cycling." Champions Matchday Magazine "You'll win nothing with kids." Or will you? Ian Hawkey explores the effect know-how has on a team's hopes of winnng the UEFA Champions League. Sportlobster TV "Footballers careers go from bad to worse, quickly." Jimmy Bullard discusses the work he did with Andy Barton on his road back from serious injury when he was at Fulham. Sportlobster TV "What does a relegation fight do to the mind?" Andy was interviewed with ex-Premiership footballers Paul McVeigh, Jimmy Bullard and Leon McKenzie for new sports social networking site Sportlobster discussing the fight to avoid relegation..
Channel 5 News "England's cricketing demise"
Interview on what led to England's poor showing in the Ashes series. BBC World News "Jonathan Trott's departure from the Ashes series"
Interview on the stress involved in Test cricket and how to deal with it. BBC Newsnight "Does preordained genius realy exist"
Interview with Matthew Syed on whether being a talented 8 year old sports performer necessarily meants being a talented adult. Womens Fitness "Everything you always wanted to know about..."
...Running. Follow our experts' simple steps to running success and you can't fail to go the distance. Mens Fitness "Change your mind"
Can harnessing the tricks of sports psychology really give you mental superpowers? One MF writer rewires his brain to find out. Flipside "Have a word with yourself"
Thesportingmind.com's Mental Performance Consultant Andy Barton explains four key areas for self improvement. Feature on the State of Origin rugby league matches in Austrailia between New South Wales and Queensland. Arise TV News "Oscar Pistorius"
Andy was interviewed by recently launched news channel Arise for a piece about the mental issues facing Oscar Pistorius as his trial approaches. Fighting Fit "Retrain your brain "
Fighting one foe is tough enough, but battling your own fears and doubts at the same time can be too much to handle. Paul Beasley delves into the mental side of combat sports to find out how the brain can be reprogrammed for optimum performance. BBC Interactive "London 2012: The Olympic also rans"
The elite athletes are racking up the golds at London 2012, but what about those who compete knowing they don't stand a chance? Reuters "Some athletes really do whistle while they work"
Trampolinists whistle, tennis players grunt and Chinese women's superheavyweight weightlifting champion Zhou Lulu screams "Fung shong!" BBC Radio 4 "Advantage Home"
Motorcycle News "What is it about winners?" Opinion: Andy Barton Mental Performance Consultant..
TEDx Sevenoaks "The Possibility of People"
Andy was asked to talk on the nature of belief and how it affects performance. Champions Magazine "A game of chance?" Science has revolutionised football, but players and coaches are still in thrall to fortune. Daily Mail "I still have the hots for racing, says Raikkonen"
Shortlist Magazine "Driven by danger"
Are F1 drivers wired differently to the rest of us? Financial Times - "War of the Roses"
CNN - "Aiming for gold"
Interview with Ben Wyatt and Matthew Syed on what it takes to gain success in the sports arena. Daily Express - "Show them your are in control"
Blogtalkradio - "Mental toughness- the elite mindset"
British Eventing Life - "Mental toolbox." Andy Barton is a mental performance consultant who works with many of the leading sports performers from the UK and around the world through his clinic ‘The Sporting Mind’ (www.thesportingmind.com). Andy’s clients include some of the country’s leading equestrians. BBC Radio 1 Newsbeat - "How strict discipline has helped Wales at the World Cup." Shortlist Magazine - "The psyche of a champion (Pages 44-45)"
The difference between Olympic gold and silver can be the smallest margin. But, finds Andrew Dickens, that vital fraction isn't always down to ability. FIFA.com - "Away-day anxiety all in the head." Men's Health - "Head strong"
Gain the mental muscle of five sporting champions - and discover the mind tricks guaranteed to build a winning mentality..
Andy was interview for CNN Sports News discussing the incident of Wayne Rooney swearing into the television cameras and whether there has been an increase such incidents in recent years. Fighting Fit Article - "Motivation: How to build the drive to succeed as a fighter"
Very few sports require so many hours of training for such short and infrequent bursts of action as boxing and martial arts. Mental performance consultant Andy Barton explores the types of motivation and goal setting that are most likely to lead you to achieving your dream - eventually! Stylist Magazine - "Rise of the competitive woman"
More women are taking up extreme physical pursuits than ever before. Stylist explores the trend for pushing yourself to the max. 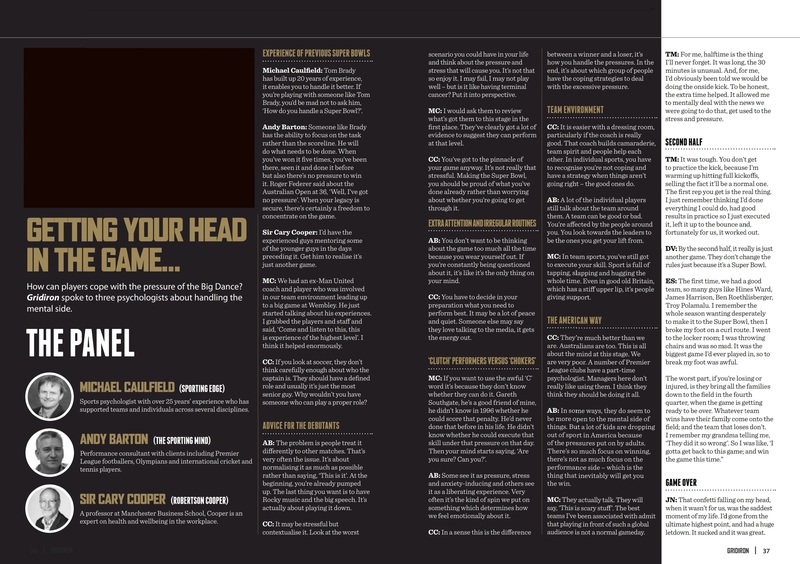 Cycling Weekly - "Four ways to get your race head on"
Psychology is the final frontier when it comes to sporting performance, so how do the pros get in the right head space? Fighting Fit Magazine - "How to learn faster"
Becoming a well-rounded fighter requires a lengthy apprenticeship, but by training smart you can learn the techniques of the trade more quickly. Running Fitness Magazine - "Rediscover your running mojo"
We all know life is a rollercoaster and that during the lows we sometimes have to sacrifice 'me time'. If life has thrown your running off-kilter, Tina Chantrey explains how to get back into your routine. Daily Mirror - "Rooney: It's over"
Manager breaks his silence and shocks football world. Cycling Weekly - "10 reasons why you're not getting any fitter"
CNN - "Net them young"
BBC Persia - "The effects of music on athletic performance"
Interview with Mehdi Beigi for BBC Persia television. BBC World Service - "Sportsworld Sunday"
Andy was a guest on Russell Fuller's show from South Africa with Brad Friedel and Stuart Pearce discussing the pyschology behind penalty shoot-outs. Champions League Final Programme - "Head Coaches"
In their quest to inspire their players to win the European crown, managers have called upon Barack Obama, Rudyard Kipling and golf. Shortlist Magazine - "The mental pressures of a World Cup captaincy"
We speak to mental performance consultant Andy Barton to discover the strains associated with that armband. Daily Telegraph - "London Marathon: 'Give up? I'd rather die trying'"
Laura Donnelly meets some of the people who have overcome physical and mental trauma to run this week's London Marathon. CNN - "Tiger's return to the Masters"
Andy was interviewed by CNN for a feature on Tiger Woods' return to the Masters. Running Fitness Magazine - "Getting High"
The benefit running has on your heart and overall fitness levels are widely acknowledged. Yet ardent runners will tell you of the existence of less palpable effects they also encounter. CNN - "Is your boss a 'Special One'?" The success achieved by Portuguese soccer coach Jose Mourinho suggests that his players would not just run through a brick wall for him, they'd happily march through an obstacle course full of them to earn his respect. Sport Magazine - "Head Coach"
Inter Milan's pouting prince Jose Mourinho is the master of mind games. Sport asked Andy Barton and Mourinho's biographer and Times' chief football commentator Patrick Barclay to shine a light on the mind of 'The Special One'. Festive cheer can be thin on the ground in the lead up to Christmas with an extra dose of stress heaped upon business managers already grappling with icy financial conditions and potentially bleak New Year prospects. CNN - "Mind games: Touchline pyschology"
The latest round of Champions League matches finds a string of top European managers on the verge of being dumped out of the competition - a failure that could cost them their job. BBC Radio Wales -"The Radio Wales Phone-In"
Andy was a guest with Olympic Gold Medallist Darren Campbell and Dr Russell Holden on Jason Mohammed's Radio Wales Phone-In. BBC Interactive - "Why do sportsmen cheat?" High profile cases of cheating and gamesmanship have dominated the back pages in recent weeks, but why do competitiors feel compelled to seek an unfair advantage? The Times - "England hope for seventh time lucky"
Time Magazine - "Is 13 too young to sail around the world solo?" True Tube - "Pressure Point"
Jo Ankier was running towards Olympic gold. Andy Barton knows what happens when the pressure is on. Champions League Final Programme - "The big day"
Mind Games - Player psychology for Rugby. Mind Games - Coach pyschology for Rugby. FourFourTwo - "Captains: Do they really matter?" When Fabio Capello was preparing to name his England skipper last year, the nation got itself into a bit of a tizz. But was it all a big fuss over nothing? Champions Magazine - "The paranormal history of football"
Are games decided by tactics - or witchdoctors, star signs and premonitions? Exploring areas professionals don't like to discuss, Martin Rosser encounters Zidane, Rooney and Einstein. Five News - "Sports psychology"
A report into the factors that can help or hinder young sports performers from achieving success. BBC Interactive - "The art of taking a penalty"
"Penalties are a marriage of technique and mentality." That is the verdict of sports psychologist Andy Barton on the seemingly simple task of sending the ball past a goalkeeper and into the net from just 12 yards out. Castrol Performance Index - "Mind over matter"
Castrol Performance Index - "Coaches on the couch"
Interview about the mental qualities of a Formula One driver. Daily Mail - "Inside the tortured mind of our hero Jonny Wilkinson"
He places the ball, steps back and sideways. For a few moments he stands, slightly bent, legs a shoulder width apart, hands clasped, eyes focused. Setanta Sports - "Experts warn Hamilton to stay focused"
Two of England's leading performance coaches have warned Lewis Hamilton he must keep his focus firmly on the track or else he runs the risk of missing out on the Formula 1 world title. The Sun - "The title is on ice." Supercool Lewis has the mental strength to be F1 champion, a top mind coach said yesterday. The Times - "Keep your imagination under control in head-to-head duels"
Chris Griggs seeks some advice on the different mental approach required to succeed at matchplay. Musa Okwonga - "A cultured left foot"
Andy was interviewed for this excellent book on the eleven elements required for footballing greatness. The book was subsequently nominated for the William Hill Sports Book of the Year. FourFourTwo Magazine - "Outside Right"
Oldham Athletic take a chance on former jailbird Lee Hughes. England vs Germany Official Programme - "The whole 12 yards"
With five wins from six shoot-outs, Germany are the undisputed world penalty champions. But why? Two Wheels Only - "The Comfort Zone"
The key to over-coming mental blocks is to focus on the positive, not the negative aspects of a situation. Interview with Alex Feeney on the run-in for the Premiership title. Daily Mail - "Mourinho the kind of mind games"
Jose Mourinho has successfully taken the pressure off his players by putting the spotlight on himself again, according to top mind coach Andy Barton. Sporting Life - "Psychologist backs Jose outburst." Chelsea a chasing the quadruple but the focus is on boss Mourinho rather than his players. Sky One - "When Nerves Attack"
Andy was interviewed for this documentary on the phenomenon of choking in sport as part of Sky's excellent Sport Uncovered series. BBC Radio 1Extra - "Praying for a win"
Andy was interviewed for this radio documentary about the power of prayer at Portsmouth Football Club, presented by former Chelsea player Gavin Peacock. BBC World Service - "Fast Track"
Andy was interviewed by Ben Wyatt discussing the power of psychology in sport. Inside United - "Can body language tell us who will win the league?" Mind coach Andy Barton puts the bosses on the couch. BBC2 Newsnight - "When sports stars crack"
Andy was a guest on Newsnight with Jeremy Paxman discussing the mental issues affecting England's cricketers in Australia. Daily Mirror - "How to get over it"
Andy wrote an article giving some advice for England's long-suffering cricket fans. 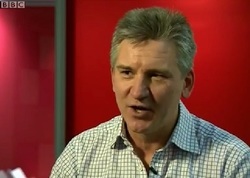 Sky News - "Under Pressure"
Andy was a guest on Sky News discussing the pressures faced by England's cricket team. Men's Health Magazine - "Why are we so aggressive?" Our continuing exploration of the male psyche uncovers the science behind our lairy gene and reveals the path to peace, self control and emotional balance. The Times - "Frontline bowler suffers attack of nerves"
Health & Fitness Magazine - "Workout Boosters"
As the cold weather draws in, it's easy to let summer fitness resolutions slip. Keep your motivation up with these top tips from Johanna Legh. Sky One - "When sports stars see red"
Andy featured in this light hearted look at some of the moments in sport where sportspeople lose their cool. Other contributors included Mark Lawrenson, Peter Schmeichel, Matt Dawson, Martin Offiah, Willie Carson and Nigel Winterburn. Cosmopolitan - "Fast track to success"
Success is a mind game. Andy Barton shows you how to get gold in life, love and the locker room, with confidence coaching for champs. Andy was interviewed by Alex Feeney at Sky News discussing psychological issues that are affecting sportspeople today. ITV1 - "Call me a cabbie"
Andy worked with Janet Street-Porter to assist her with her mental strategies for learning street names in her quest to become a London cabbie. TalkSport - "John Gaunt morning show"
Andy was a guest on John Gaunt's show discussing the WAGs (Wives and Girlfriends) issue during the World Cup. Professional Motorsport World - "Personnel Best"
Providing your team members with incentives is just one way to help improve their performance. PMW talks to four motivational experts. ITV1 - "The truth about referees"
A documentary about the problems referees face in football today, with other contributions from David Beckham and Anders Frisk. The Daily Telegraph - "Gym'll fix it? No, just reach for the stairs." Lucy Atkins on a lifestyle approach to exercise that takes the sweat out of getting fit. ITV Evening News - "The mind of Mourinho"
A commentary on the mental strategies of Jose Mourinho ahead of the second leg of the Champions League fixture with Barcelona. Sky News - "Andy Murray"
A report on Andy Murray becoming the British Number One tennis player. FourFourTwo Magazine - "The hit parade"
TalkSport - "Howard Hughes show"
Andy was a guest on Howard Hughes' show discussing human potential. Health & Fitness Magazine - "Virtual Triumphs"
The Times - "How to... deal with failure"
ITV News Report - "The Ashes"
An interview about the mental approach taken by the England cricket team to win back the Ashes. Men's Fitness Magazine - "The 50 best running tips ever"
Dance Gazette - "Be very afraid"
Men's Fitness Magazine - "Think like a winner"
ITV News - "The Champions League"
The mental factors that enabled Liverpool to come back from being three goals down to win the Champions League Final. The Times - "Bowyer finds few to appreciate his brand of madness"
ZDF News (Germany) - "Jose Mourinho"
An interview with ZDF News Channel in Germany leading up to Chelsea's Champions League match with Bayern Munich. Andy was asked to comment on Jose Mourinho's mental strategies. TalkSport Radio - "Afternoon show"
Andy was asked to comment on a bizarre tirade by Jose Mourinho about the perceived injustices of European football. Health & Fitness Magazine - "Kickstart your fitness"
The Times - "Paul to exploit the powers of positive thinking"